Unsurprisingly, driver distraction is a major cause of road accidents and can come in the form of anything from your mobile ringing, to your kid dropping their toy in the backseat. 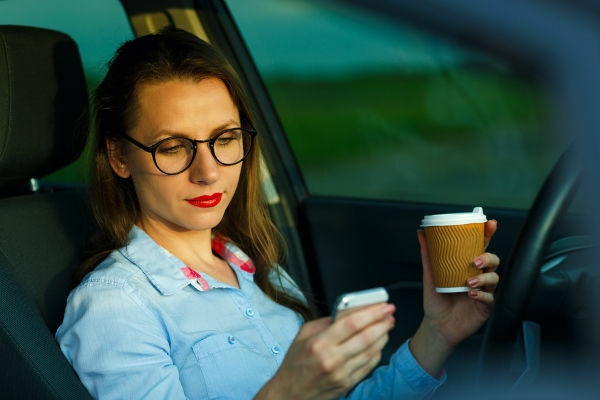 Your mobile phone-Using mobile phones or other smart devices while driving can be very dangerous and distracting, increasing your chance of being involved in a crash or near crash. It’s illegal to use mobiles while driving unless they are in a stable holder or can be operated by the driver without touching any part of the phone and the phone is not resting on any part of the driver’s body. Other passengers, particularly kids-Research suggests that children in cars are more distracting than mobiles. The most common distractions with other passengers are turning to look at them in the back seat or watching from the rear view mirror. Car stereos and entertainment systems-Adjusting the radio can be very distracting. Also listening to radio programs can cause cognitive distraction your mind is more focused on the program then the task of driving. GPS devices-One of the most common human errors when using a GPS is being overly confident in how smart the device actually is. The devices are error prone. Trusting the device too much has caused people to drive into hazardous areas. Turn off your mobile phone before you get in your car — that way you won’t be tempted to answer your phone. If you can’t avoid having your mobile phone on, install a hands free kit — that way you can drive and talk on your phone more safely, but don’t forget to keep concentrating on driving. providing a range of healthy snacks and drinks (avoid milk-based products if your child is prone to car sickness). Plan regular stops to beat fatigue and let the kids burn some energy (at least a 15 minute break every 2 hours is recommended). If you do need to attend to your children during the trip, pull over and stop the vehicle before sorting out the situation. If you’re listening to CDs choose your music before you start your trip. If you’re listening to the radio make sure the stations are tuned in before you set off so you aren’t searching for a station while you’re driving. If you need to change the music, stop your vehicle before you start playing with the buttons. Focus — distracted drivers are dangerous. Here you can find more helpful advice on avoiding distractions when you drive.